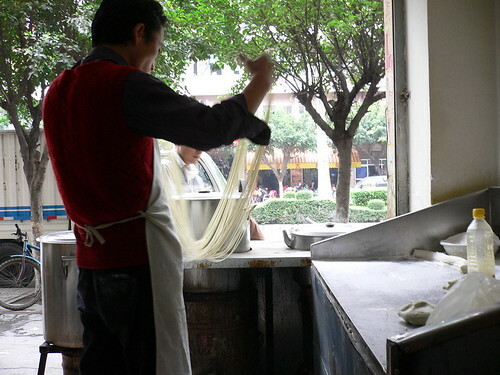 We noticed recently that the beef noodle shop just outside my factory was always packed with people. Yah, granted that with only 5 tables in the shop, it is easily to have a full house of a daily basis. Still, the curiosity got the better of us we decide to go try it out. As you would know, hygiene is not exactly a strong point for these holes in the wall and I think I must have had a death wish to want to venture there right after I just got over a bout of poisoning. What was I thinking? Frankly? I haven't the faintest clue. Anyway, the first thing that we noticed was the Musl1m headgear that they donned on their heads which meant that they were probably from the inner western Ch1na, around the regions of XinJiang. 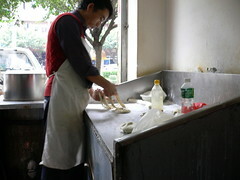 Once we placed our orders, the chef immediately started to work on the dough which is to be the noodles that we are about to eat. Very interesting to see the noodles from the humble unglam looking piece of dough turning into graceful fine strands of Ch1na pasta. Well, the portions were rather generous and the ingredients were definitely fresh, considering the high sales turnover of the shop. Noodles especially, since they were made right before our eyes. Soup base was damn good but the only pity was the beef. Damn tough. Easier to chew a pencil eraser and rather bland. The boss was aware of this and couldn't help apologising. He explained that the stew was only made in the morning as his business has been so good that the stew couldn't stay in the pot long enough! 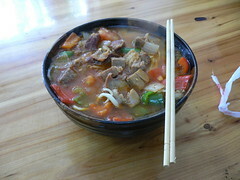 As a result, the beef didn't have enough time to tender as well as to have the flavour from the stew infused into the beef proper. Price? 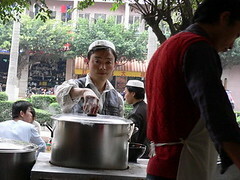 RMB 5.00 for a small bowl and the one I had is RMB 6.00.
akk: Yah. It was very tasty. Just too bad about the beef. A case of so near yet so far. OMG this is bloody cheap! sunflower: Cost of living is indeed very very low this part of town and if one can get used to the local living conditions, one can easily retire here very comfortably.